One of the certainties of my life came crashing down this afternoon. It all happened so casually: some of my colleagues are responsible for editing and publishing the information that is sent to our stores. One moment we were laughing about how appallingly illiterate and incomprehensible much of the copy they are sent seems to be, the next they were laughing about how these same idiots always seemed to put a double-space after a full-stop. Um. Is that not right? No, apparently it is not. Furthermore, it seemed that I was the only person in our immediate vicinity who did not realise it. I had to check, obviously. "Every modern typographer agrees on the one-space rule. It's one of the canonical rules of the profession, in the same way that waiters know that the salad fork goes to the left of the dinner fork and fashion designers know to put men's shirt buttons on the right and women's on the left. Every major style guide—including the Modern Language Association Style Manual and the Chicago Manual of Style—prescribes a single space after a period. (The Publications Manual of the American Psychological Association, used widely in the social sciences, allows for two spaces in draft manuscripts but recommends one space in published work.) Most ordinary people would know the one-space rule, too, if it weren't for a quirk of history. In the middle of the last century, a now-outmoded technology—the manual typewriter—invaded the American workplace. To accommodate that machine's shortcomings, everyone began to type wrong. And even though we no longer use typewriters, we all still type like we do." How could I not know this? Why has no one ever pointed this out to me? I'm fairly sure that - errors and auto-formatting aside - every single sentence that I have ever typed has begun with a double space where it follows a full stop. I even do it in text messages and, unless I'm pressed for character count, I do it on Twitter too. I've never been taught how to type, but the habit is deeply ingrained. I'm doing it now. Look at me go. I don't think I can stop. To be fair, if the boot was on the other foot, I doubt that I would be any more magnanimous. You know what really hurts? That part of this is clearly a generational thing. I grew up handwriting letters and wrote every single one of my school essays by hand. I loved to write, and for Christmas in around about 1981/2, my parents gave me an electric typewriter. They did this to encourage me in my writing and it was a beautiful, thoughtful thing to give me. It was quite a big present, and the first thing that I typed out on it at my desk in my bedroom was that I was sure I would be using this wonderful gift at least until the year 2000....at the time an unimaginably long eighteen years away. 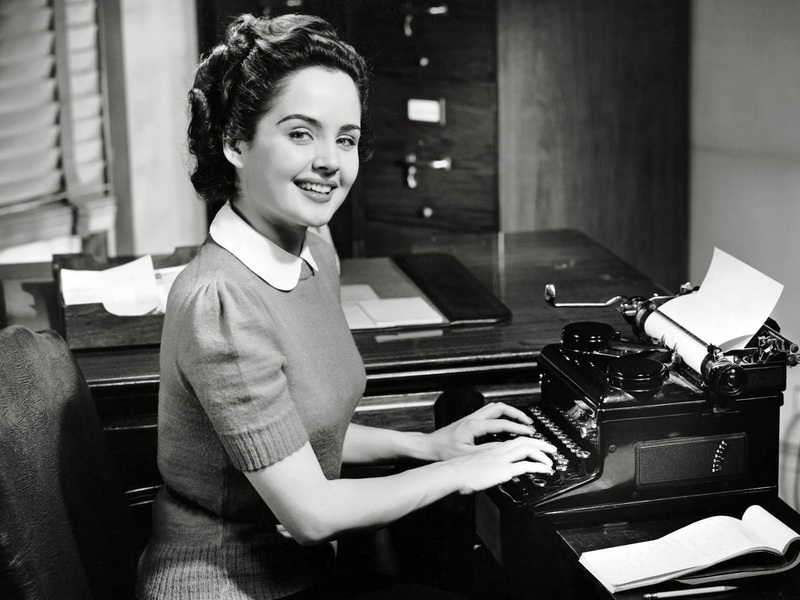 Of course, by then, the typewriter had long since been discarded because we were all using computers. I can remember when I spent four months studying in Venice in the Winter of 1994. Because the only computers we had were locked up in our place of study over the weekend and because none of us had laptops yet, we were forced to handwrite our course essays. Even then, it felt odd - my process for composing an essay was now almost entirely built on an ability - taken totally for granted on a computer - to chop and change what you were writing at will and to only print it out when you had finished. Handwriting the whole thing was a harder and very much more laborious task indeed. Change was coming though, and by the summer of the following year, laptop prices had dropped sufficiently far that I had one of my own to take to start my Masters degree in York, and by the time my younger brother was at university, a bare two years later, every room had a network point... which in itself is entirely obsolete in a world of ubiquitous WiFi. As I looked around the office this afternoon at the faces of my colleagues who simply didn't understand what the big deal was or why this simple revelation might shake my world, it dawned on me: I was the only person there who was old enough to have owned a typewriter. To everyone else, that was something that was long obsolete before they ever even thought to pick up a pen*. You know how, to a toddler, a magazine is an iPad that doesn't work? I am obsolete. I am a relic. I am also clearly wrong. I've generally think that it's nonsense to think that you can't teach an old dog new tricks.... but all the additional spaces in this post are now taunting me. * The same kids probably think that the CAPS LOCK button on a keyboard is to help you type out your LOLs and ROFLs. Do you think they've even ever seen a typewriter, never mind wondered how it worked? I still tend to use a double-space after a period when typing. Although I'm slowly breaking myself of the habit. One nice thing about the habit is that HTML automatically ignores the second space, and formats it with only one. Another aspect about it is iOS. When I type two spaces, the first one is replaced by a period, thus reinforcing the habit. Hi Dan - I use that feature of iOS all the damn time. Now I know why I feel so comfortable with it! I'm not sure I want to wean myself off this habit or not (even if I can). Now I know it's wrong though, it's going to annoy me. Or, I could just not care on the grounds that no one else has ever mentioned this to me in the past.... so why change now? Its a typewriter tradition I believe; with typewriters there was a mechanical (etiquette?) reason for having a greater space after a period. With the advent electronic photoset devices, runs of large spaces of white were ignored, so there was a gradual trend away from using 1.5 or double spacing. At least that was what I was taught. Oddly i argued with guys at work over this exact thing a while back. Also the one that really gets me, is whether you need a period after a question mark? My view is that the period is there already in the symbol, so no you don't. no, you don't - I think you're absolutely right. The other good one is ellipsis. You only use three dots - ... - unless you're at the end of the sentence, then you use 4, with the last one being the period. Even Word knows that (look at the spacing). Word to your nanna.